← JTA Audience... Did You Back The Barge? Today’s Visual Guide update continues to look at Disney’s Star Wars Toybox figures. This time, we are adding Luke Skywalker (5). Click below to check him out! You can also check him out further in our full review. ← Jabba's Sail Barge (The Khetanna) Is FULLY BACKED! Thank You! JTA Audience... Did You Back The Barge? We are in ‘backed’ territory now, and moving beyond 5000! We want to see how many of our viewers backed the barge? If you backed at least 1, or have every intention of backing one before the deadline, go vote yes… otherwise, well, I guess you vote no. Click through to vote! ← Hasbro: The Sail Barge Is A Shoo-In, Can We #bringbackthesarlacc Now? Jabba's Sail Barge (The Khetanna) Is FULLY BACKED! Thank You! BREAKING NEWS! We did it! 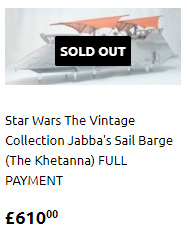 Jabba’s Sail Barge (The Khetanna) became FULLY BACKED at 1:44 PM ET! What an incredible achievement to celebrate! We had planned to post this later today, but we think it’s going to be entirely backed before then! Don’t experience FOMO! #backthebarge now! Special thanks to Binary_Sun for sharing his talent with us! Let’s finish up the Star Wars Toybox wave 2 mini marathon with Luke Skywalker! He is another fantastic release! See him in our Research Droids Reviews today! Be sure to leave your thoughts in our comments section, vote in the poll or even comment about it on our Facebook page. Click the banner below for the direct link to the review! As always, you can also send your review requests via email if you’d like to see something that we didn’t cover yet. Special thanks to JTA moderator and friend Sjefke for passing this along. I think it speaks for itself. ← Comparison Picture: Hasbro Jabba's Sail Barge Versus Millennium Falcon! How Many Klaatu (Skiff Guard) Action Figures Will Fit On The Barge? Hasbro has ALSO put together a stunning video showing us how many Klaatu action figures are able to fit on this mammoth beast. Check out the video on our Facebook page! ← An Itemized List Of Figures Needed To Populate Your #backthebarge Purchase! Comparison Picture: Hasbro Jabba's Sail Barge Versus Millennium Falcon! Hasbro and Litzky PR have shared a comparison picture with us showing the size differences between the “Big” Millennium Falcon and Jabba’s Sail Barge! #backthebarge! We’re officially 80% backed! We just hit 4000 backers! #backthebarge! JTA reader Sam T. provides today’s advertisement for #backthebarge! JTA reader Michael M. sends us a side by side comparison image of the Death Star Trooper to illustrate just how much better the figure looks with “photorealistic” paint operations. Check it out! Actress Laura Dern, who portrayed Vice Admiral Holdo in The Last Jedi, gave an interview to Entertainment Weekly and dropped quite a revelation: Holdo is secretly Force sensitive. Click through for more details! ← Share This Jabba's Sail Barge FAQ All Over The Web! To celebrate the official release of Star Wars: The Last Jedi on Blu-ray yesterday, Hasbro would love to share with you some #HasbroToyPic cover art! They’ve teamed up with @sgtbananas to bring you three exclusive Blu-ray covers featuring Hasbro’s The Black Series 6″ figures! You can download all three amazing recreations on StarWars.com here. Share This Jabba's Sail Barge FAQ All Over The Web! In time for the disc release of The Last Jedi, Screen Junkies have released their honest trailer for the movie. The trailer is really funny and pokes fun at everything and everyone, including the fans. Check it out and have a good laugh! And remember, it’s only a movie! 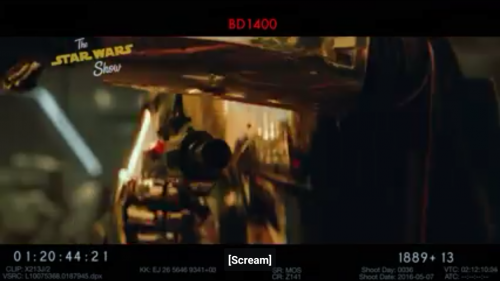 I think the honest trailer sums up the debates surrounding the movie perfectly. But decide for yourself! ← TBS6 Jaina Solo (Legends) IN STOCK at TARGET.com For $9.99! 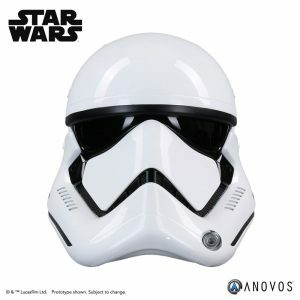 ANOVOS is proud to offer the Star Wars: The Last Jedi First Order™ Stormtrooper™ Premier Helmet Accessory. The Premier Line offering is for the insatiable costumer, who needs every detail meticulously studied and excruciatingly reproduced for the ultimate wearable costume. Noted differences from Star Wars: The Force Awakens variant include updated helmet clips, nose, teeth detail, and left aerator. Pre-order this at the ANOVOS web site now. 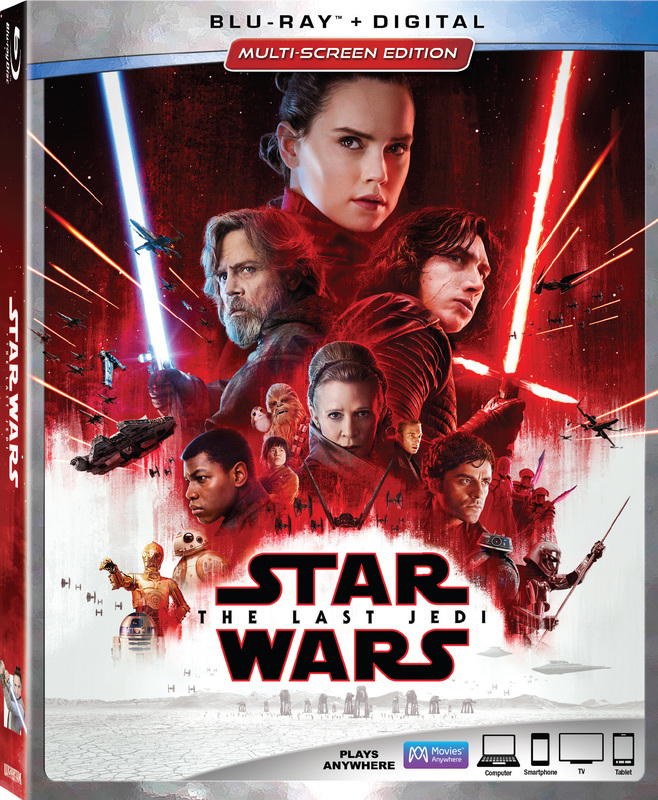 ← The Last Jedi Now Out On Blu-Ray And DVD! Here Is What YOUR Jabba's Sail Barge Could Look Like! Do you want to see what you’ll be missing if you don’t #backthebarge? JTA reader Cloned has put together a magnificent collaged image showing all the appropriate action figures situated in different areas of Jabba’s Sail Barge. Don’t you want to do this too? The only way you can is if you #backthebarge! Go! Go go! Make it work! Do you want to catch up on securing the figures needed to populate your Jabba’s Sail Barge? Then catch up on eBay HERE! ← Khetanna On Dark Side Toys Sold Out In Under 20 Minutes! We're SINGLE-DIGIT Days Away From The #backthebarge Deadline! Here is another important reminder announcement for Jabba’s Sail Barge (The Khetanna). Once again, special thanks to JTA reader Binary_Sun for the brilliant artwork. Khetanna On Dark Side Toys Sold Out In Under 20 Minutes! I was just about to write an article about Dark Side Toys and the chance to once again pre-order the Khetanna on their website… when both payment options for the barge sold out in record time. Dark Side Toys had a contingent of 30 barges they would or could sell. Once these 30 barges were pre-ordered Dark Side Toys would no longer accept new pre-orders. DST opened pre-orders for the Khetanna at 9 p.m. GMT, it is now 9:25 p.m. GMT as I write this. The 30 available barges were sold in just 20 minutes. So, Europeans now only have MyUS as one of their options or they just wait for Hasbro to come forward with a plan! Fellow North Americans can’t expect much more help from Europe, I’m afraid. UPDATE: you may try your luck and go to Dark Side Toys and spam refresh in your browser, because as it seems some duplicate orders will get canceled, as well as pre-orders paid via PayPal, credit card and debit card is the only accepted payment method and it’s only one barge each! Although still too expensive for terrible people like CJ, Entertainment Earth has their beautiful Astromech Droid six-pack for a mere $25.99. Thanks to friend Nick. B. for the alert! Besides, you’ll need Jabba’s Astromech Droid for Jabba’s Sail Barge! Raisin' Backers: Now With Added Sweetener! 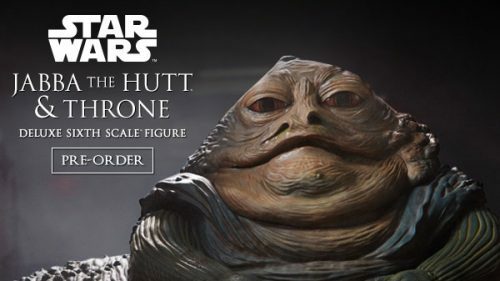 JTA sponsor Big Boy Collectibles wanted us to let you know that the The Black Series Solo movie figures are up for pre-order, with figures due to ship on April 13th. They are also taking pre-orders for Captain Rex & Darth Revan. Full details on their pre-order page! ← Take Charge And #backthebarge! Can We Adjust 2018's The Vintage Collection Packaging To Perfect It? Here is today’s advertisement for #backthebarge! Graphic courtesy of JTA reader Binary_Sun. JTA sponsor EmpireToyShop just listed their Star Wars $50 Mystery Box! Random Chaser figures include a Hot Toys Hoth Leia, and the new 6″ Dewback set! Click HERE for more! Attention all Europeans: British etailer Dark Side Toys has announced on their Facebook page that they will reopen pre-orders for the Khetanna next week for the final time! Please check Dark Side Toys’ website or Facebook page regularly so you don’t miss your opportunity to get the barge. We will also post something as soon as pre-orders actually open again. This may be the best chance for Europeans to get the barge at a fair price. Also, your effort will make sure the barge will be a success. 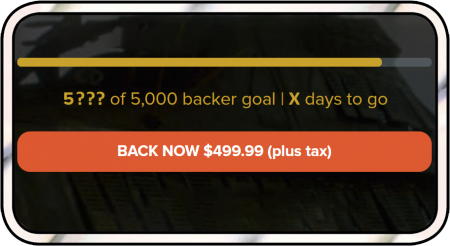 Every single backer counts. If You Did Already #backthebarge, Please Back ONE MORE! 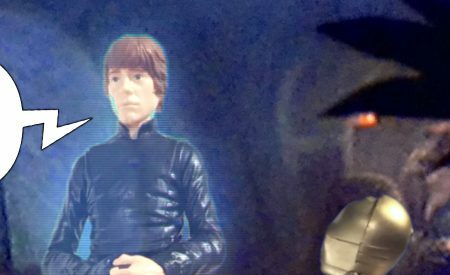 ← The Black Series [Phase III] 4-LOM Has Light-Up Eyes! It’s time (finally) for the return of The Vintage Collection! And, this wave picks up right where it left off in 2012. First up for our Visual Guides is the Rebel Soldier (Hoth) (VC120) on a beautiful The Empire Strikes Back card back. Click below to have a look at this figure, and make sure to check out our full review for additional gallery images, review write-up, and more! 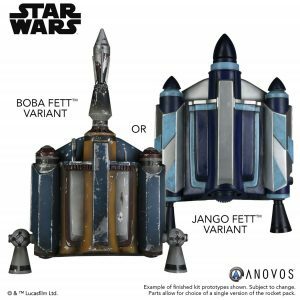 Check out the new Mandalorian Jetpack Kit from ANOVOS. These are now available for pre-order. ANOVOS is proud to offer the Star Wars Mandalorian™ Jetpack Kit. 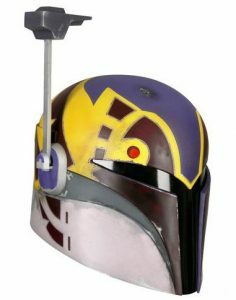 The kit offers the choice to build the Boba Fett™ version, the Jango Fett™ version, or your own custom Mandalorian creation! 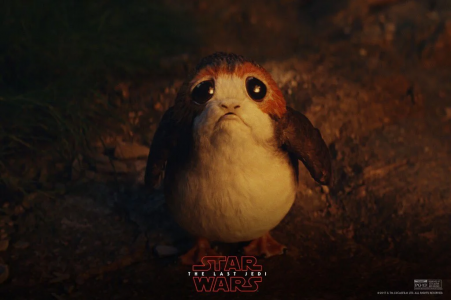 In Star Wars: The Last Jedi, Luke Skywalker is reunited with his sister, Princess Leia Organa, for a deeply touching scene that was one of the emotional highlights of the action-packed sci-fi epic. 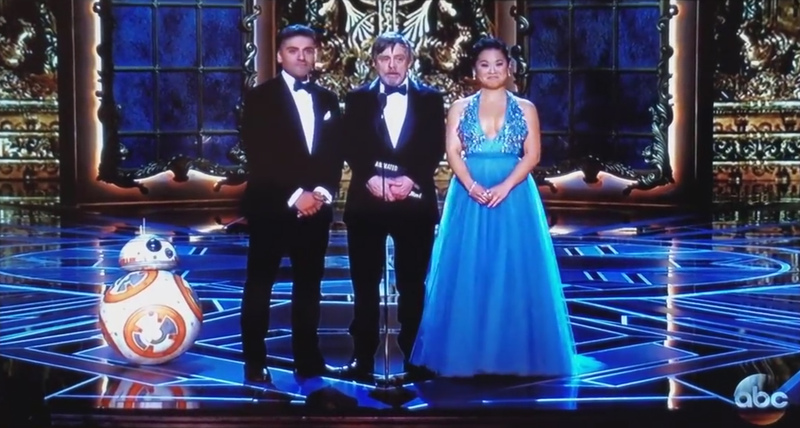 As it turns out, the scene was nearly as emotional for stars Mark Hamill and Carrie Fisher, who shared the screen for the first time as their characters since Star Wars: Return of the Jedi in 1983. Jedi Temple Archives wasn’t the only site given the exclusive invite to Hasbro’s Google Hangout yesterday. We were joined by other colleagues in our community too. Click through to see who did (and didn’t) participate. You can also click each link and be taken to their own Q&A posts. While many questions were repetitious to our own group’s, there are still new details in most of them that may be of interest to you. We are so incredibly thrilled that The Vintage Collection is back! And we hope you hear it in our voice! Let’s kick off with the Rebel Soldier (Hoth) (VC120). We couldn’t think of a better figure than to kick off TVC’s reboot with than this figure. He is the focus of our Research Droids Reviews today! Be sure to leave your thoughts in our comments section, vote in the poll or even comment about it on our Facebook page. Click the banner below for the direct link to the review! As always, you can also send your review requests via email if you’d like to see something that we didn’t cover yet. ← The Vintage Collection Wave 17 Sneak Peek! Look at all thos wonderful toys (on eBay). Special thanks to JTA reader Ginji A. for the alert. Bubblegate Rears Its Ugly Head.... For The Vintage Collection?! Yikes. Our stomachs sank a like a brick after learning and seeing this news. Could Bubblegate be making a return along with The Vintage Collection? We have obtained an exclusive image of the TVC First Order Stormtrooper that has CLEAR EVIDENCE of the bubble separating from the card. There is even tape keeping the bubble onto the card in case the bubble frees itself completely. Hasbro, please deal with this issue as soon as possible! Hopefully, they’re already aware and have already taken measures to resolve future production. JTA would like to welcome new sponsor Big Boy Collectibles to our Sponsor family. Click through to read a little history on their store, and make sure to stop by and check out the wide variety of collectibles they have to offer. ← Can't Or Won't Back The Barge? Back Toys R Us Instead! Jedi Temple Archives was invited to an exclusive Google Hangout session with Hasbro earlier today. We partnered with Star Wars Action News and our pals at Bantha Skull to ask a series of burning questions we had about the first HasLab campaign. 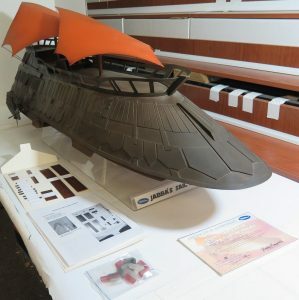 The Hasbro Team talked about the recently revealed painted Jabba’s Sail Barge prototype and exclusive Yak Face figure. Then we were offered the opportunity to ask the Hasbro Team our questions, one at a time, by each fan site represented until the Q&A time expired. Finally, Hasbro gave us an intimate look at the painted Jabba’s Sail Barge with close-ups and verbally described its many unique features. We’d like to thank Hasbro for taking time out of their day to do this Google Hangout session with us, and we appreciate Litzky PR for coordinating it. They also have provided NEW and EXCLUSIVE images of some of the finer details of this beautiful vessel. Click through for more! *There are secrets in this image – Find out what they are! British etailer Dark Side Toys has suspended further sales of the Khetanna for now. Click through to read their statement! ← Hasbro: Exclusive Figures Are Indispensable For #backthebarge Success! JTA sponsor Big Bad Toy Store sends in their latest newsletter, with details on all of their newest pre-orders and arrivals. Get all the details after the jump! Hasbro: Exclusive Figures Are Indispensable For #backthebarge Success! HASBRO! Do you see what including an exclusive figure has done for the #backthebarge campaign? We are even aware of collectors that have come out their slumber hiatus SOLELY FOR THE YAK FACE figure (card back exclusive) and have plopped down $500 to back this project (FOR THE YAK FACE FIGURE!). As a result of your intelligent action, we’ve had close to 200 more backers since the announcement this morning, and we blew right into the 3000+ area now. Collectors want to feel like they’re getting something exclusive here. We’d like to suggest keeping that momentum going. You have produced some FANTASTIC figures throughout the years that aren’t in need of an update (there will be differing opinions here for sure). However, below are eight examples/ideas of other figures you can also include with Jabba’s Sail Barge (The Khetanna). Again, make the 1985 The Power Of The Force card backs exclusives for HasLab, and if needed, release the original vintage Kenner card back for the general marketplace items. Click through for more! It has been a fun four years, but it is time for the final Rebels Review. Thank you to all of the readers who have supported the Rebels Reviews series over the years. Now, lets talk about the end of Star Wars Rebels! Click the banner below to read JTA’s final Rebels Review! ← Rebel Trooper (Hoth) BACK IN STOCK On eBay! Hasbro and Litzky PR have passed along official PRESS images of today’s painted Jabba’s Sail Barge (The Khetanna) reveal and EXCLUSIVE Yak Face figure. See the full gallery on our Facebook page. Hasbro is evidently proud of their painted sample. They just posted a time-lapse video on Twitter showing how it got its beautiful deco. Check it out! ← EW.com Reveals Jabba's Sail Barge Painted Prototype + Exclusive Yak Face! EW.com Reveals Jabba's Sail Barge Painted Prototype + Exclusive Yak Face! ← The Vintage Collection 2018 Wave 1 For Sale On eBay - Ships In Days! The Vintage Collection 2018 Wave 1 For Sale On eBay - Ships In Days! The 2018 phase of The Vintage Collection is already on eBay with characters already selling out briskly. The Hoth Rebel Trooper is the first to go it seems. If you’re interested, you know where to go. If you read some of the ads carefully you’ll see that promo code discounts apply. Cases are shipping as early as a few days! ← Bantha Skull Celebrate Their 10-Year Anniversary! Author and collector Paul Berry wanted us to help spread the word on his new Star Wars collectible resource: Star Wars Memorabilia: An Unofficial Guide to Star Wars Collectables, which is now available. He also sent along a few excerpts from his book. Get all the details after the jump! We want to wish our terrific friends at Bantha Skull a Happy 10-Year Anniversary! We’re honored to count you as friends! ← BREAKING NEWS! Jabba's Sail Barge WILL NOT BE AVAILABLE AT RETAIL! British magazine Empire held its Empire Awards ceremony last Sunday. The winners for each category are voted by the readers of the magazine. And even though it is believed by some that 50% of the fans hate The Last Jedi, at least the British readers of Empire Magazine thought differently and the movie won a couple of awards. Which ones? Click here to find out more! BREAKING NEWS! Jabba's Sail Barge WILL NOT BE AVAILABLE AT RETAIL! FINALLY! Hasbro makes it crystal clear for those unable or unwilling to understand/accept this. We had addressed this question/issue for clarity with Hasbro and were told there was nothing to share at that time. Apparently, it’s because they planned to make an official announcement. So here it is. Jabba’s Sail Barge (The Khetanna) WILL NOT be made available at any retail location in USA or Canada. It will only be available through HasLab! So if you want this thing, you better back it! #backthebarge Special thanks to our friends at Bantha Skull for the alert to this development. Okay, Okay, not quite what you’re thinking. But for the cost of the shipping alone on this eBay auction, you could get your own four-foot Sail Barge. What Makes a Good Wave? The awesome Vintage Collection is just around the corner, and with it comes the prospect of new figures, the re-release of some we haven’t seen in quite some time, and a few we’ve seen pretty recently… To go along with Paul’s article, I wanted to offer up some additional thoughts. There is one thing in particular that will be essential in making sure we get through one wave to the next: case assortments. What makes a good wave? Click through for some examples and be sure to leave your comments. One of the neatest-looking characters from the Solo: A Star Wars Story trailer was Enfys Nest. 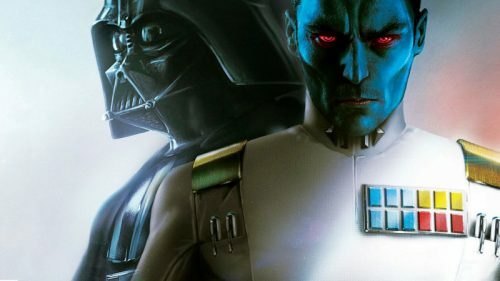 With cool figures like the Range Trooper and that filthy Stormtrooper, we would LOVE to see this character get produced in super-articulated glory too. It seems possible now that The Vintage Collection is back, doesn’t it? ← KB Toys To Return After A Decade Out Of Business? Hasbro, this is a public service announcement from JTA. We want to ensure the health and longevity of the return of The Vintage Collection. As such, we’d like to emphasize how important it is that figures like Rey, First Order Stormtrooper, Kylo Ren and perhaps even Snoke, should probably not be carried forward into any other subsequent waves. Sorry for our premature panic, but we don’t want to write The Vintage Collection’s eulogy a second time as early as this Christmas. 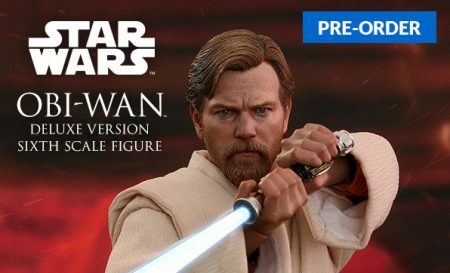 As a reminder, if you absolutely MUST repack figures, we have a huge list of generation 1 TVC figures in addition to figures from The Black Series [Phase I and Phase II], The Legacy Collection and Legacy Collection that would love to join the lineup and will be much more successful for the line’s longevity. Please let us know if we and other fan sites can help. 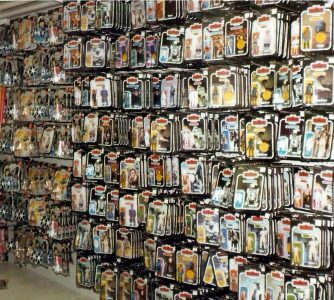 Remember, by and large, the people buying The Vintage Collection line are Original Trilogy enthusiasts looking to complete the “Collect All 92!” figures as well as other OT-inspired characters that never received the chance to be placed in glory on Kenner-inspired card backs. Also, getting more of those original TVC figures out again will provide new stock for those jumping on this train for the first time. Thank you! 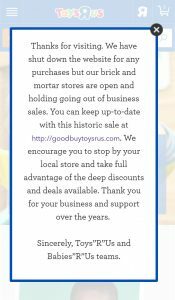 KB Toys To Return After A Decade Out Of Business? Is this real? 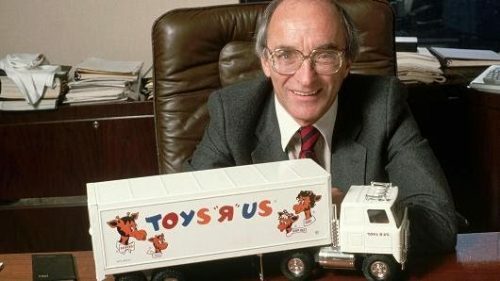 LinkedIn has posted an article claiming that Kay Bee Toys is making a return, which is quite a coincidence after Toys R Us’ downfall. Could this be the new home for Hasbro exclusives? Is this just a dream? Check out the article and then come back here to discuss it! Disney has released some info on the upcoming Forces Of Destiny YouTube Episodes. The new season with 8 episodes will begin March 19th. Click here to find out what characters will make an appearence in the show! We’ve opened up our guide listing for the recent Topps A New Hope Black & White series, including a gallery of our box break. I wasn’t too excited about a set of black & white cards, but I was pleasantly surprised at how nice these came out. Unfortunately, it takes several boxes to put a complete set together. It would have been nice, at the bare minimum, to get a base set (or close to it) out of a box. Click through for a complete listing and our box break gallery. There are more store reports coming in of new Solo: A Star Wars Story related product coming in (we’ll only be showing Hasbro confirmed and officially announced products) despite a clearly marked street date on the boxes. Special thanks to JTA reader PJ for this report! Also, it looks like Wookiee Weekend is coming April 13th. Let’s now look at Obi-Wan Kenobi (Kamino Confrontation) from the awesome Star Wars [Saga – Phase III] Ultra line. He’s the focus of our Research Droids Reviews today! Be sure to leave your thoughts in our comments section, vote in the poll or even comment about it on our Facebook page. Click the banner below for the direct link to the review! As always, you can also send your review requests via email if you’d like to see something that we didn’t cover yet. Found! TBS6 Grand Moff Tarkin Wave + New Solo Figures Hit Retail! Wow! The Grand Moff Tarkin wave of 6″ TBS6 figures (including NEW Solo figures) has been found at retail already. JTA reader K. Andrews lucked out greaty today! Click through for his story! Is There An Unavoidable Reason Barge Numbers Are Dropping? Longtime JTA reader and 3.75″ super-articulated enthusiast Mike R. sent us some disconcerting news about his #backthebarge order. It was canceled because of a PayPal time window protocol. Could this be the reason we’re starting to see orders fall off? Click through for more. Check out the latest Brian’s Toys newsletter… It’s getting warmer every day, and we’re getting in new items every day. Save big this month between the 2nd and the 11th on select items! 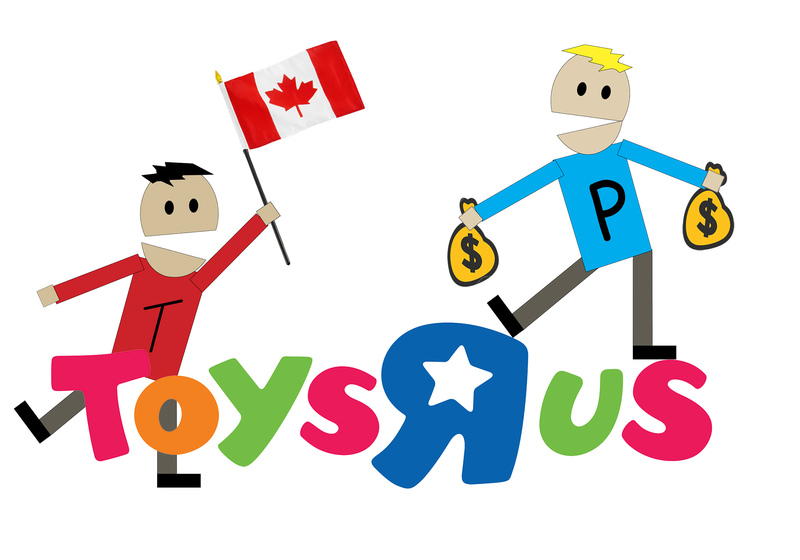 ← Hurry Up And Use Your Toys R Us Gift Cards! Force Link Luke Jedi And Emperor's Royal Guard Are Awesome Figures! 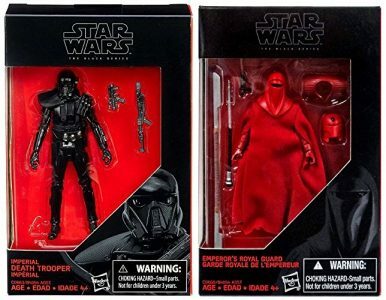 We all remember the great TARGET exclusive Force Link three-pack that included Emperor Palpatine, Luke Skywalker and an Emperor’s Royal Guard. (See our review of it HERE if you’re not familiar with it.) We also recall Hasbro released Emperor Palpatine as a single-carded basic figure. But many collectors wondered if the other two figures from that three-pack would also be released singly as well. It would make sense that Hasbro would have both Luke Skywalker and Emperor’s Royal Guard on their radar for releases as single basic figures too, wouldn’t it? Do You Have Any Burning Questions About Jabba's Sail Barge? If you could ask Hasbro anything about the Jabba’s Sail Barge (The Khetanna) HasLab campaign, what would you wa nt to know? Let us know in the comments and we will do our best to get answers for you. ← BREAKING NEWS! New UK Option For Jabba's Sail Barge Via Dark Side Toys?! 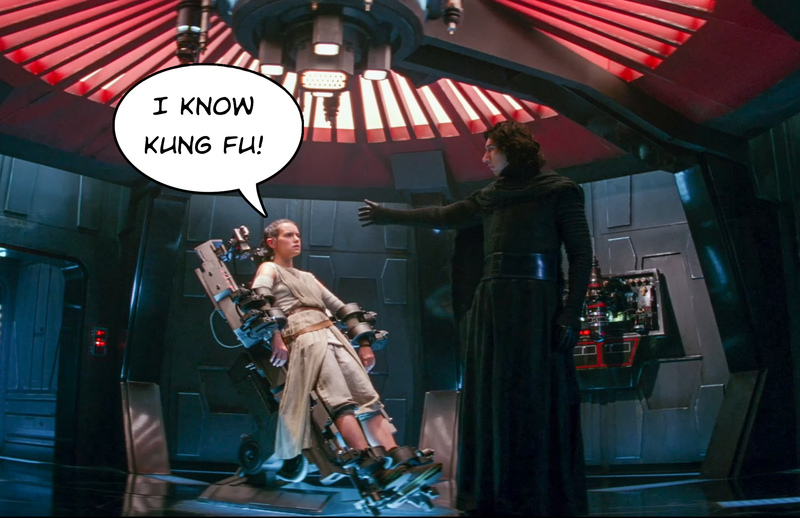 UPDATE: io9 has posted a correction on this story. The cause of confusion is that Steven Spielberg contradicted himself. BREAKING NEWS! New UK Option For Jabba's Sail Barge Via Dark Side Toys?! UPDATE: If you live in these countries, you’re in luck! Click “Full Story” for list of countries! 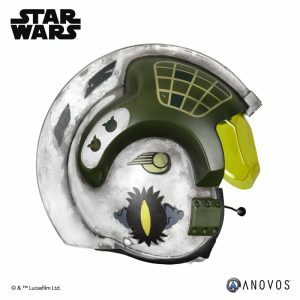 ANOVOS has opened up the pre-orders for their Gold Leader Rebel Pilot Helmet, shipping summer 2018. Click here for full details and pre-order information. It may be the Ides of March, but Hasbro remains happy and positive about Jabba’s Sail Barge and sends us exclusive information on the item’s shipping box. 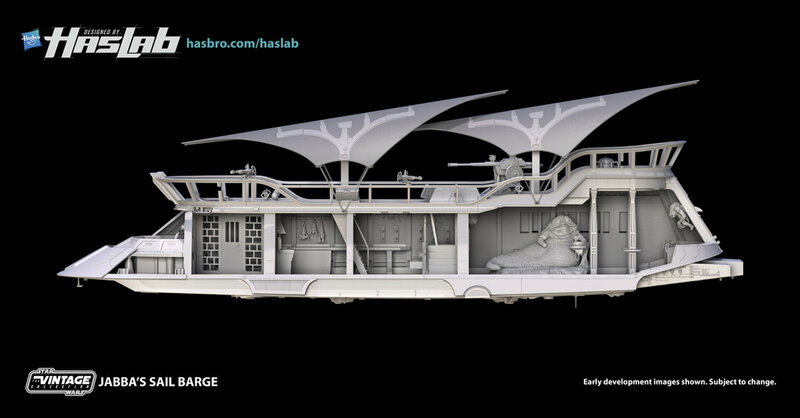 Since Jabba’s Sail Barge is now more than halfway to reaching its goal, Hasbro would love to say thank you for the amazing support behind this HasLab initiative by moving forward with the reveal of another exciting tidbit! Please see the attached exclusive image of Hasbro’s own Mark Boudreaux holding the Barge’s white box mock-up for scale. You’ve been curious to see how this will come packaged, now the official box size has been revealed. Mark Hamill took to social media to share the evolution of the Luke Skywalker action figure over the last 40 years and gave some humorous commentary on the four Star Wars toys that he chose. Hamill is an avid user of social media and is always interacting with fans who seem to hit him up all day, every day. The 66-year old actor doesn’t seem to mind and takes the time when he can to properly interact with the millions of Star Wars fans all over the world. 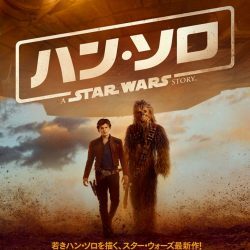 Movieweb.com has the full story. 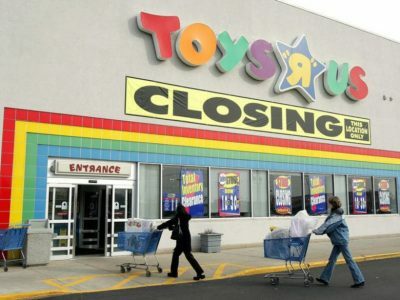 ← Toys R Us: The Final Blow? Last night we received a special delivery from Litzky PR and Hasbro: the Battle On Crait multipack and a free digital download of The Last Jedi. We thank them for this package. Click the image below to see it. You can read our review of it HERE. 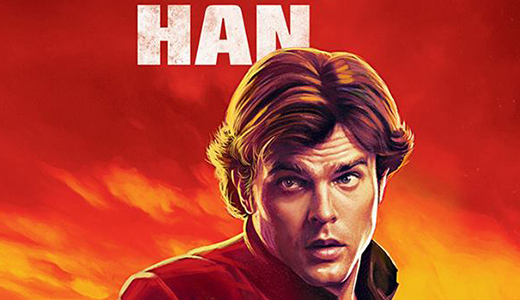 After a French artist had complained about plagiarism last week, Disney has now released new posters for the upcoming Han Solo movie. The posters were revealed on the Brazilian Star Wars Facebook page. Click here to see the four new character posters! Jason Fry’s “The Last Jedi” novel reveals how Rey could use the Jedi mind trick on Starkiller base and later force pull the lightsaber from the snow – without any training whatsoever. Click here to find out how she did it! We are doing some behind-the-scenes upgrades to our server, which is affecting some of the site structure right now. We will be working on this over the next few days. While all content should be functional, some things might just be laid out a bit funny until we complete the upgrade. So, if you see something out of whack, it’s probably because our maintenance droids are on a break! Thanks! Update: We’ve fixed most of our layout issues. We have a few very minor functionality issues we are working on. 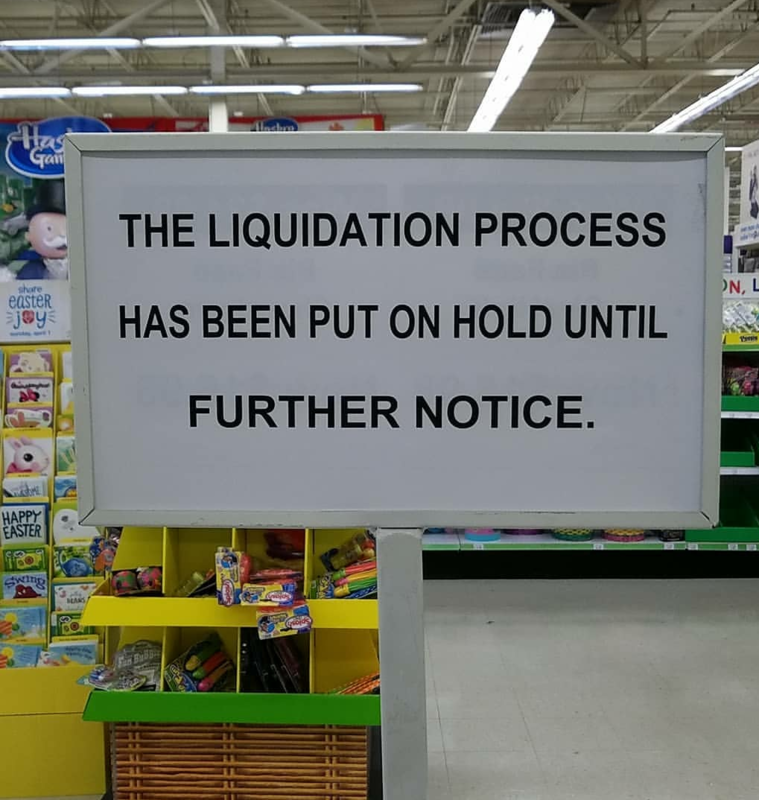 Toys R Us is in the process of drafting the court motion for its liquidation plan, a source familiar with the situation told CNBC. See the full story there. ← DJ (Canto Bight) And Rey (Island Journey) IN STOCK + 20% Off! Website Filmschoolprojects has an article about the “The Last Jedi” making of documentary. In the documentary it is said that Russian Twitter bots actually started a #HuxLive campaign early on to make sure the character won’t be killed in the movie. 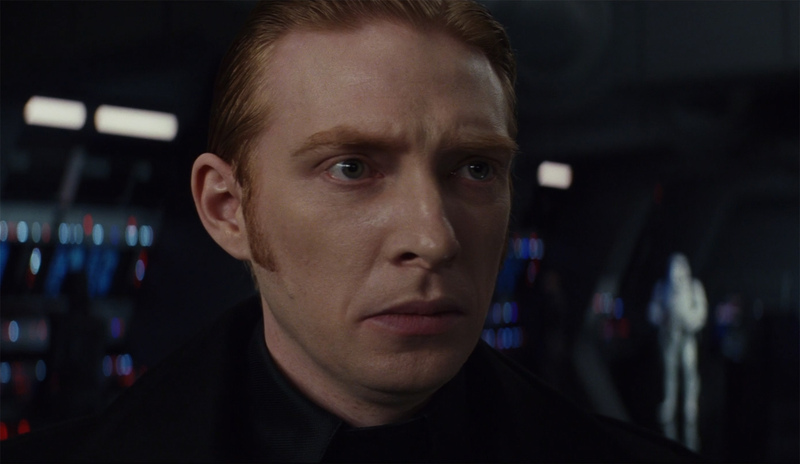 Is this the actual reason Hux survives The Last Jedi? I doubt it. Whatever, I wish those Russian Twitter bots had started a #LukeLive campaign instead. General Hux. Happy to be alive. If we ever get Jabba’s Sail Barge (The Khetanna), there will undoubtedly be people who will need skiff guards to populate it. Infamous eBay seller tunghori has some tremendous Jabba-focused aliens and other related figures in stock. Choose from the rare red bandana Kithaba, Vizam, and BAR2-D2. Special thanks to JTA reader and friend Martin M. for the alert! After some recent articles I think it is a good idea to get everyone to calm down just a little. Most here are probably not acquainted with crowdfunding. And this is Hasbro’s first foray into crowdfunding too – and what a project it is. They ask for no more than $2,500,000. Or $500 from each backer. As of now the Barge has 2,595 backers. Progress has stalled considerably in the past few days, despite opening up the project to Canada. Reason for panic? Is the Barge bound to fail? Let me show you a few graphics to give you hope and confidence. ← Is It Just The Price That Is Making The HasLab Campaign Fail? Hasbro has passed along the six pages of the HasLab Behind The Workbench booklet on Jabba’s Sail Barge (The Khetanna). This 64-page booklet will be made available if the Sail Barge meets its minimum backers. Click HERE to download your copy. Is It Just The Price That Is Making The HasLab Campaign Fail? Basic math tells us that we can get to $2.5 million dollars in many ways (the magic number required to make this long-awaited vehicle a reality). So it made us wonder if collectors would be more inclined to pick up Jabba’s Sail Barge (The Khetanna) if it were half the price. That would of course mean we would need double the backers. How many of you would be more inclined to pick up this beast if it were half the price (also knowing that there would be double the units in the marketplace and double the backers needed). Or would there be 7,143 of us who would be willing to back this thing for $350? Is the $500 price point the real killer of this first HasLab offering? Or is it so much more than this? With special thanks to JTA reader Binary_Sun, here is today’s advertisement for #backthebarge! We're 50% Backed For The Barge! It’s OFFICIAL! We’re halfway there. Keep livin’ on a prayer! #backthebarge! Hasbro Wants Five Thousand; No Less! Well, it’s official. Collectors are Jabba The Hutt and Steve Evans and Hasbro are Boushh (in a powerfully descriptive metaphor). As collectors try to suggest to Hasbro that 2500 backers are good enough for Jabba’s Sail Barge (The Khetanna) instead of the full goal required, Steve Evans from Hasbro makes it painfully clear in our comments that Hasbro needs 5000 backers, no less. As we continue to wish, hope and fantasize that this thing is coming despite this fact, maybe we can eventually both agree that 3500 is the most fair number here. (There we go fantasizing again.) In the meantime #backthebarge people. This is serious now, folks. #backthebarge! Disney Parks has released an unlisted video on YouTube featuring video footage of a drone flying over the construction site of Star Wars Galaxy’s Edge in Anaheim, California. The 14 acre Star Wars: Galaxy’s Edge will open in 2019. And construction seems to well on its way to completion next year. Are you already planning a trip? 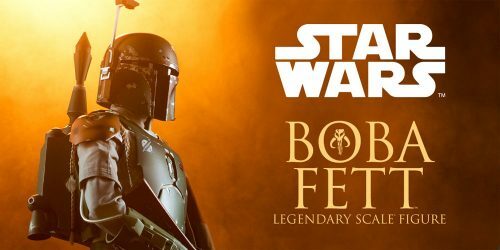 ← Boba Fett Backs The Barge And So Should You! Site comicbook.com has posted a preview of the “Behind The Workbench” book that will accompany Jabba’s Sail Barge (The Khetanna) if the minimum backing is met. Does anyone else find it odd that these booklets would be published and printed before the backing minimum is met? Anyway, check it out and be sure to come back here to talk about it! 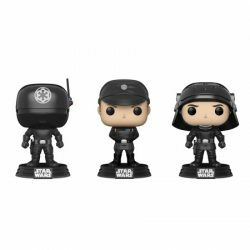 ← Walmart Exclusive Funko Pop Death Star 3-Pack In Stock! With special thanks to JTA reader Binary_Son for the artwork, here is your daily reminder to #backthebarge! Snap to it! Packaged Images Of All New TBS6, TVC And Solo Products! Foreign site www.blackseries.de has posted packaged images of new Star Wars stuff, all of which has been officially confirmed and revealed by Hasbro at Toy Fair last month. Check out the images and be sure to come back here and talk about it! This is where everyone publishing these images is getting their info from, so now you know too!! Yikes. It’s doesn’t look great, folks. 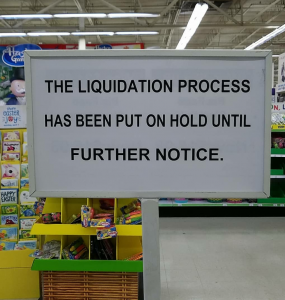 Toys R Us appears to be prepping itself for liquidation. Bloomberg explains what’s going on so be sure to check out their article. I hope this doesn’t spell certain doom for their exclusive The Black Series [Phase III] Zuckuss figure, not to mention all of the employment loss here. ← Big Announcement! Jon Favreau To Produce And Write Live-Action Star Wars! CRAZY Prices On Amazon For The Last Jedi Force Link Toys! Holy Toledo! Check out the AMAZING pricing on a ton of Star Wars [The Last Jedi] Force Link products on Amazon.com!! The BB-8 2-In-1 Mega Playset is less than $70. Many Two-Packs and Deluxe sets are HALF OFF! Vehicles are going for a song and dance! Check out all of this sale GOODNESS! ← Two Cool Characters From The Empire Strikes Back! 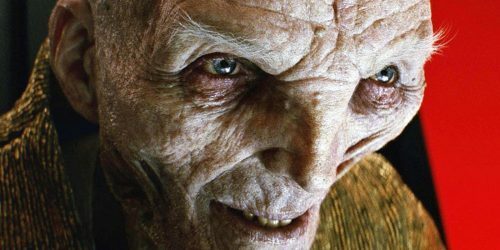 Will Snoke Reappear In A Star Wars Movie? ← John Williams Is Over The Sequel Trilogy Too! Two Cool Characters From The Empire Strikes Back! I have always wondered if there was some link between General Veers and Princess Leia Organa, who looks absolutely divine in her Bespin Gown by the way. 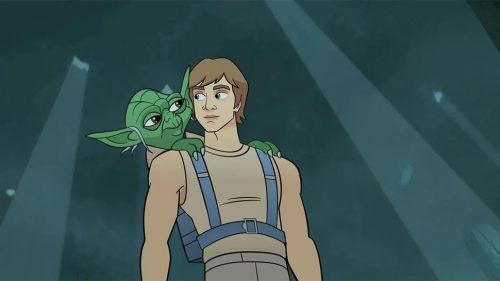 Although they never had contact with each other in The Empire Strikes Back, it seems something else elusive inextricably links them. I bet you six to one we’ll find out soon. John Williams Is Over The Sequel Trilogy Too! 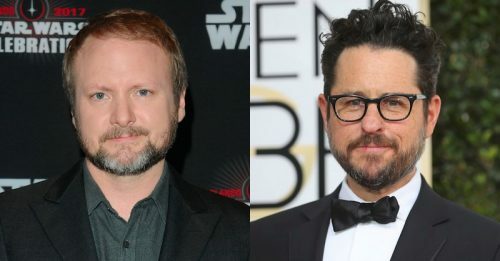 Actually, we have no idea if he is over the Sequel Trilogy, but he is over making music for Star Wars beginning in 2019! Newsarama is reporting that John Williams will be leaving the Star Wars franchise next year. Special thanks to Martin M. for the alert to this story! Jabba Wants You To BACK THE BARGE! Here is your daily harassment to Back the Barge! Special thanks to JTA reader Binary Son for this clever artwork. 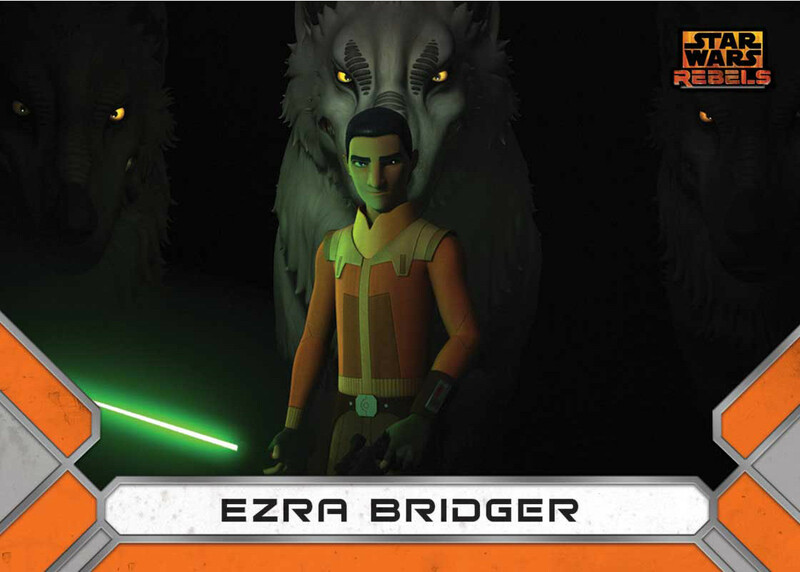 Topps has a new limited edition card set celebrating the Series Finale of Star Wars: Rebels. The Star Wars: Rebels Series Finale set is a Topps On Demand online exclusive, showcasing the most pivotal characters and special guest stars from the show. This set is only available for 2 weeks (or while supplies last). Click here for the set details and order page. 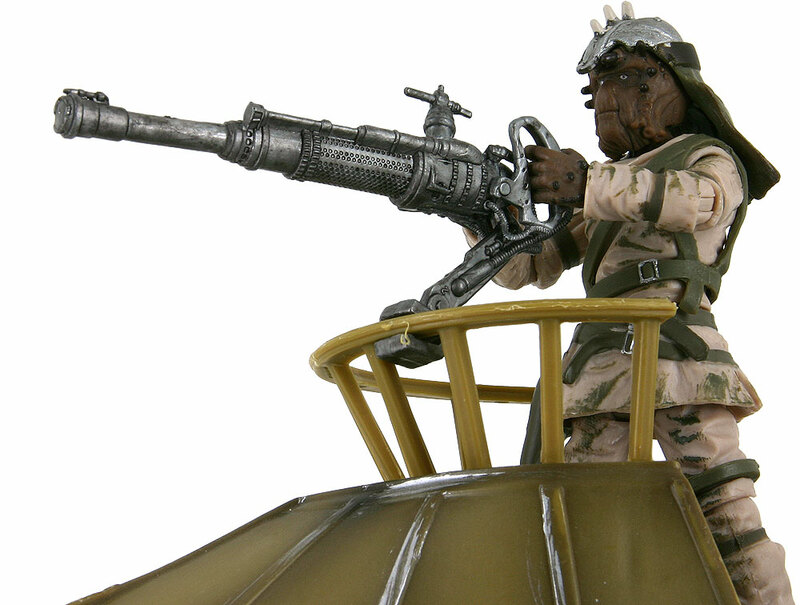 ← Unproduced SA 3.75" Figures Revealed Including Death Star Gunner! 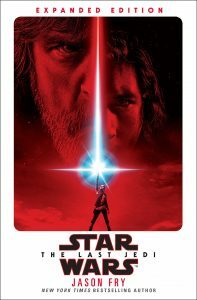 The expanded edition of Star Wars: The Last Jedi is out today in hardback. Click here to order this on Amazon if you haven’t already! Unproduced SA 3.75" Figures Revealed Including Death Star Gunner! This is cool! Instagram user gorkoracing has images of unproduced super-articulated 3.75″ action figures. There apparently was supposed to be an Echo Base set produced including a revised Rebel Trooper and an all-new Probe Droid. He also lists that a new Death Star Gunner was part of the set, but I am certain he is mistaken. If you recall, JTA broke the news of the Death Star Gunner coming as part of the now-canceled The Black Series [Phase I] line as a basic figure for which we have insider information. (That Death Star Gunner basic figure release apparently never came to pass.) Hopefully, Hasbro gets all of this beautiful glory released in the relaunched The Vintage Collection! Special thanks to friend Victoria from Victoria’s Cantina for the alert! 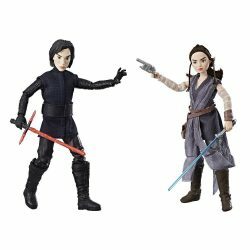 ← Kylo Ren & Rey Forces of Destiny In Stock At HTS! 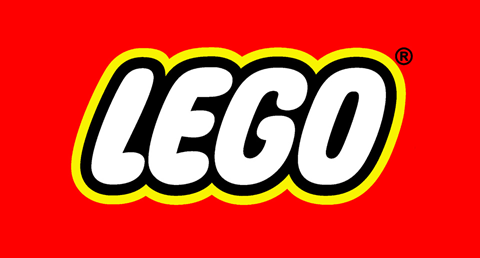 LEGO released its full year results for 2017 earlier today. And after more than a decade of constant growth LEGO saw its first revenue decline in 2017. Revenue was 5.8 billion USD, which is 8% less than 2016. Net profit was 1.7 billion USD, a 17% decrease. Make of that what you will. The question is, what were their expectations? I think it’s safe to assume that LEGO Star Wars probably saw some decline, which would be in line for the overall trend for Star Wars toys in 2017. Did you buy any of the TLJ LEGO sets last year? OK, I am angry* about two things this morning. And you wouldn’t like me when I am angry*. Firstly, I am angry* at my supposed friend Chris S. for alerting me to the horrific news that the HasLab Jabba’s Sail Barge (The Khetanna) is now heading in the reverse direction for backers. (We lost everyone yesterday who backed and then some.) And I am angry* at Hasbro that they cannot make this thing with the backers who already signed up. It’s a sad turn of events when a vehicle of this magnitude cannot be produced for nearly 1.2 million dollars. I don’t know what to say, folks, I think it’s time to stick a fork in this. **Headline is inspired by Seinfeld. ← Gamestop Exclusive ECCC Padme Amidala Pop In Stock! 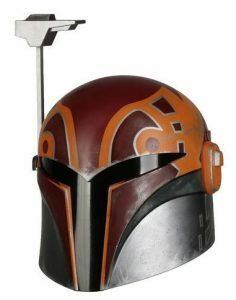 ANOVOS reveals a second version of their Sabine Wren wearable helmet. Now you can get it in both the Season 2 or the Season 4 deco. Click here for their pre-order page. Steve Evans, and Hasbro. We think it’s great that you’re soliciting Instagram advice for The Vintage Conversation. Just keep in mind that there is a huge population of old people that don’t even know what Instagram is and a LOT of Instagram people think you’re asking questions for 6″ stuff (as well as asking for stuff that’s already been produced). Heck, I STILL feel dirty creating an account. Anyway, we thought this was worthy of front page news to get your attention. When it comes to playset ideas, you needn’t look further than Kenner’s Micro Collection of stunning and beautiful playsets for inspirations. If you make all four of these (three were produced, and one died on the concept/development table) in 3.75″ scale for The Vintage Collection, you will probably be hailed in a way that you possibly just cannot comprehend right now. This is how we need playsets to be: interactive, connecting and beautiful. The Kenner Micro Collection had the right approach, just the wrong size. Just make them extra “purty” with today’s technology, change a few things up and make TVC collectors elated with joy. Make it happen, please! The Hot Toys Princess Leia [Hoth] figure is beautiful. See why it is a must-have purchase in our Research Droids Reviews today! Be sure to leave your thoughts in our comments section, vote in the poll or even comment about it on our Facebook page. Click the banner below for the direct link to the review! As always, you can also send your review requests via email if you’d like to see something that we didn’t cover yet. Step It Up Hasbro 3.75" Super-Articulated The Vintage Collection Fans! 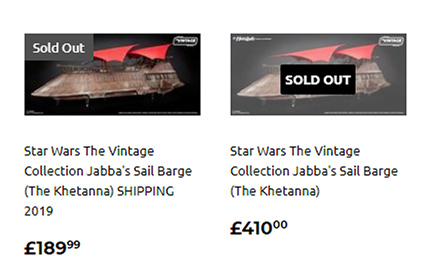 We here at JTA have done everything possible to “sell” Jabba’s Sail Barge (The Khetanna) to you. (Oh, don’t worry, we will still be obsessively posting about it.) We offered ideas like selling your children, going into debt for it (you should have see all of the sub-tweeting on that one), and offered suggestions on how to circumvent the America/Canada-only ordering option. We don’t know what else to do. All we know is that at midnight we start the last 30 days countdown for this gorgeous item, and all we feel is angst and panic, just like Homer Simpson felt when he got stuck on that airplane to do missionary work in a foreign land. We’re NOT even half way there yet. Even Bon Jovi was half-way there. Don’t keep livin’ on a prayer! PLEASE BACK THE BARGE! Save us Jebus! “Wolves and a Door” introduced a lot of compelling ideas and featured two huge guest stars. Ian McDiarmid returned to Star Wars for the first time since Revenge of the Sith and Malcolm McDowell made his Star Wars debut. Click the banner below to read the full review! Blatant Plagiarizing Or An Honest Oversight? 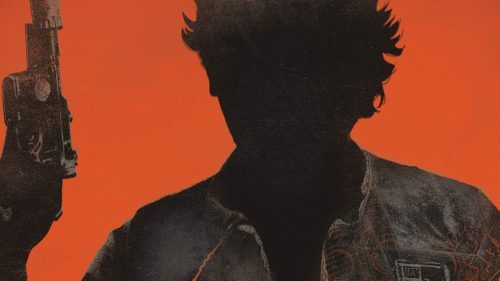 Remember those cool Solo: A Star Wars Story posters? Well, it looks like the artist that made them was “inspired” by a series of SONY music compilation CDs. You be the judge. Special thanks to JTA reader and friend Danny R. for the alert! 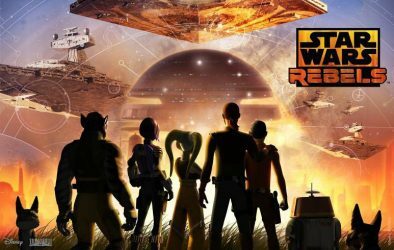 Star Wars Rebels slowed down to properly address a devastating loss in “DUME.” Click the banner below to read JTA’s full review! UK Resident Claims To Have Successfully Ordered The Sail Barge - Here's How! We have just learned something that may make the HasLab Jabba’s Sail Barge (The Khetanna) a reality. 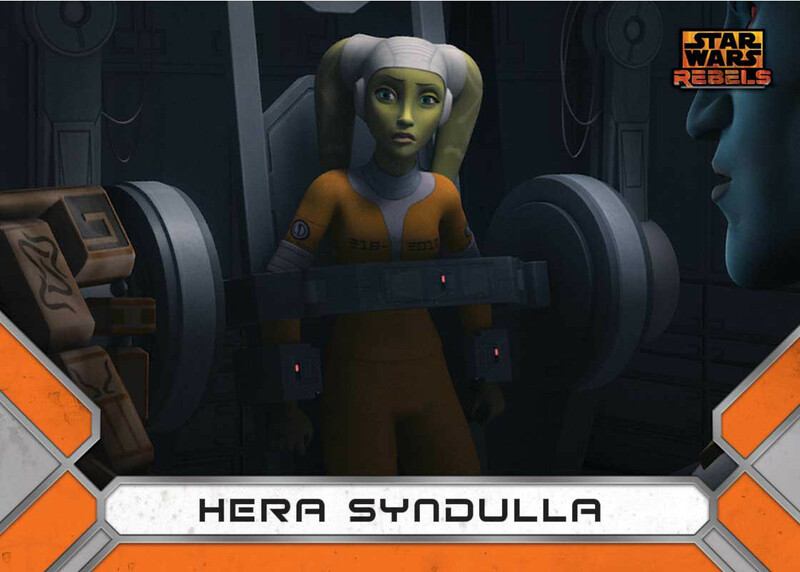 JTA reader and friend has alerted us to a thread in the forums at Rebelscum. A reader from the UK has SUCCESSFULLY placed an order for the Sail Barge via MyUS.com. Special thanks to JTA reader and friend Nick N. for alerting us to this thread. Hopefully it can help out our UK readeship in some way. Click through for more. UPDATE: MyUs.com was actually presented by JTA weeks ago. I just forgot about it. Apologies for the confusion. But another example can only help the cause! Brian’s Toys sends in their latest newsletter. Spring weather is coming just in time for a fun sale! ← Was/Is The Bantha And Tusken Raider Planned For The 6" Line? 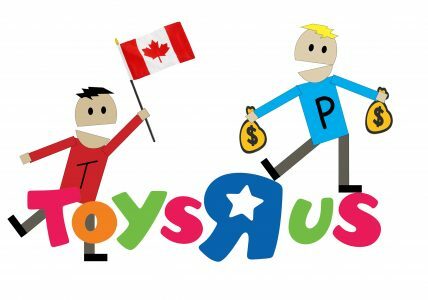 JTA Reader Russ T. Featured On Toys R Us' Fan Vault! JTA reader and friend Russ T. has been featured on Toy R Us’ Fan Vault. They worked up a cool video on him and the video shows off his beautiful collection. Be sure to check it out! Was/Is The Bantha And Tusken Raider Planned For The 6" Line? This is either (A) exciting news or (B) interesting news. Gregory Titus, artist for The Black Series line, has been bombarding his StarWars Art Gallery Twitter page with some great artwork he did for the line. Conspicuously obvious is the artwork for a Bantha and Tusken Raider package. Was this planned for the line? Is it still planned for the line? Only time will tell!! Special thanks to JTA reader Nathan M. for the alert! ← Jabba's Sail Barge: Now Available In Canada! Entertainment Weekly has an exclusive first look at five deleted scenes from Star Wars: The Last Jedi. 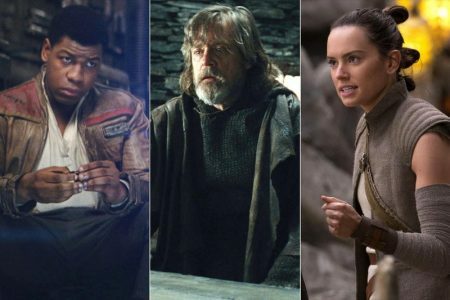 In addition to descriptions of these deleted scenes, EW also asked Rian Johnson about the scenes in question. The most noteworthy scene that was discussed focused on Luke and Leia mourning the death of Han Solo. Click through to read about the deleted scenes and the comments from Johnson! A new wave of The Last Jedi Funko Pop! Figures have been revealed on their website. Click through to see the figures you want in TVC already made in to Pop! Figures. ← Will The HasLab Sail Barge Campaign Be A Success? JTA Welcomes Two New Staff Members! You may have seen some new names floating around our site lately. Jedi Temple Archives is thrilled to welcome Thomas Otto from Germany and Caleb Amos from the USA to our already fantastic team. Thomas and Caleb join Chuck Paskovics, Paul Harrison, Mike Taber and Colin Borden and they’re helping to round out our voice and presence in the Star Wars fan site community. Their unique perspectives and distinct voices have already enhanced our front page here. And we’re excited for what they will bring in the future. Please be sure to welcome them and say hello if you have the chance! Will The HasLab Sail Barge Campaign Be A Success? 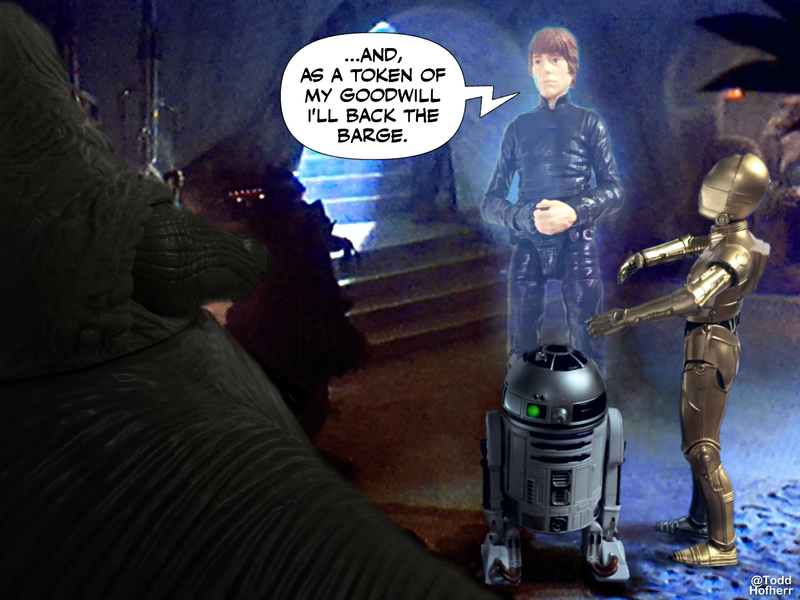 Ever since Hasbro launched HasLab with its first campaign, Jabba’s Sail Barge, the question was: will it be a success? As of now the barge has 2,131 backers. Which accounts for 42.62% of the backers needed. There are some stats we can use to see whether or not the campaign might reach its goal of 5,000 backers. Click here to find out more! The next wave of the Star Wars Toybox line picks characters from the Original Trilogy! Let’s check out Darth Vader from this very fun line of figures! He is the focus of our Research Droids Reviews today! Be sure to leave your thoughts in our comments section, vote in the poll or even comment about it on our Facebook page. Click the banner below for the direct link to the review! As always, you can also send your review requests via email if you’d like to see something that we didn’t cover yet.